Indeed, after what seems like weeks of calls for a pause and retest of the rebound rally, it looks like stocks are ready to give it a go, according to Bloomberg's Andrew Cinko who notes that the "turgid growth forecasts for the UK and euro-area are a good enough excuse to step back today and let prices contract" and adds that enthusiasm for equities certainly appears to have waned given "tepid U.S. composite trading volume and the lack of price movement intraday." What does this mean? According to McElligott the tactical implication is that the 2018 "hawkish normalization era" is long-gone, and instead we have resumed the "race to zero" posture, as globally, central banks scramble to be "more dovish" than their neighbor, which is also driving further USD strength, as the by-far "best of an ugly bunch." In the meantime, Nomura notes that amid this latest global growth scare, fixed-income has accelerated its rally, with German Bunds making new contract highs after the European outlook cut headlines, while Equities and growth-sensitives (commodities/Risk FX/EM FX) sell-off, tied to this ongoing USD strength. Also of note, the previously discussed - and unexplained - sharp plunge in 3M USD Libor, which saw its biggest fixing drop since Mary 2009. A few more observations from Nomura on the recent surge in the dollar, which has seen a "a huge reversal to the upside" with the DXY +1.4% since the day following the Fed’s dovish pivot, as the rest of world joins the parade in what looks to be a “race to the bottom” as noted above in bullet 2. This “TINA” dynamic with US Dollar is, without a doubt, the largest hindrance to "weak USD" consensus view in most 2019 forecasts, McElligott's included -as the global slowdown and idiosyncratic issues again “force” Dollar stickiness as “the cleanest dirty shirt” of the bunch. With this in mind, and as concerns for a renewed drift lower in stocks bubble up, what could be the catalyst for inflation upside surprise? 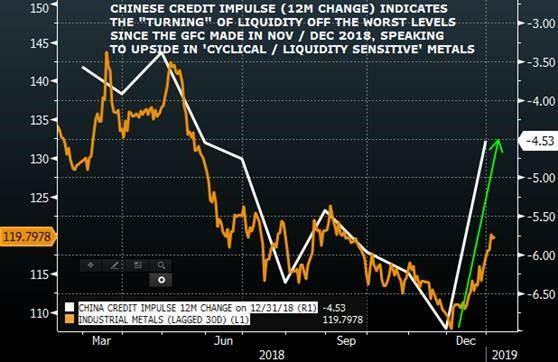 As MCElligott explained yesterday, one place where a global reflation wave could emerge from is the Chinese "liquidity- / credit- impulse", which he is "keenly watching" for signs of continued pivot higher that could bleed-through into global inflation expectations. While it remains to be seen if China can sustain this bounce in credit conditions, if the answer is yes, and if China's latest reflation attempt spills over across the Atlantic and impacts the US, then watch out below as the Fed will now be truly trapped between the threat of sliding risk assets on one hand, and a tidal wave of new Chinese inflation set to arrive on US shores.